Especially in the business community, the term "gamification" has become popular. 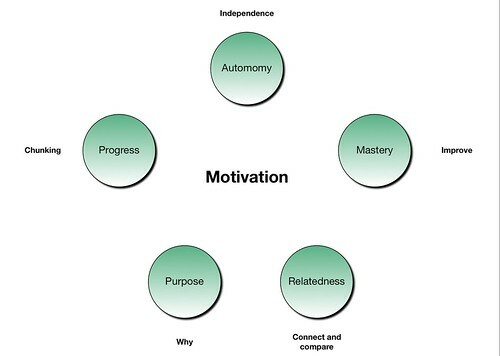 Gamification refers taking elements from game play, such as rewards and levels, and applying them to business processes, such as sales, learning, and using websites. Examples of gamification elements include a points system, levels, leader boards, badges, and progress bars. Although gamification is a fairly new term, the concepts of rewarding and recognizing behavior have been around for thousands of years. BF Skinner quantified and documented the basic principles of reinforcement in his book The Science of Human Behavior. The behavior reward sheets that are used to reinforce the behavior of children also fit into the category of gamification. It seems like badges can be found everywhere. Much like scout badges, when you complete certain tasks, you receive a badge. 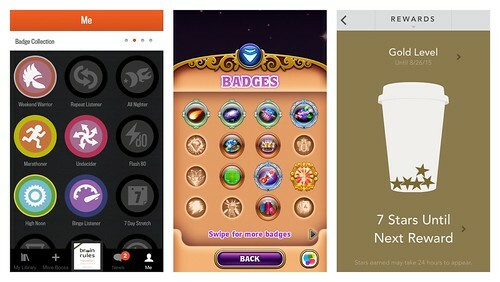 Below are badges from Audible's audio book app, badges from the game Bejeweled, and stars earned towards a free item at Starbucks. purpose - a desire to answer "why"
I've been working on a large project where I am writing out tips for presentations in several categories. After learning about gamification and badges, I decided to create a set of badges that I can highlight as I make progress. This is a low fidelity method of gamification because it is basically circles drawn on paper. Remember that "no" is just a word. My hand-drawn badges are displayed below. So far, I have earned one badge by completing all of the tips related to that category.